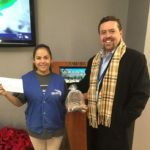 NERY CABRERA IS OCTOBER’S RISING STAR EMPLOYEE OF THE MONTH! Nery Cabrera BRAVO! supervisor from our New Jersey Region has been awarded “Rising Star Employee of the Month” for October 2017. Nery works at Yeshiva in NJ and his role as a supervisor is outstanding. He is reliable, dedicated and committed to deliver the best service possible. Thank you Nery!